I’ve done some quick paint jobs on some units to reinforce my Italian Africa force for the Battlegroup rules. 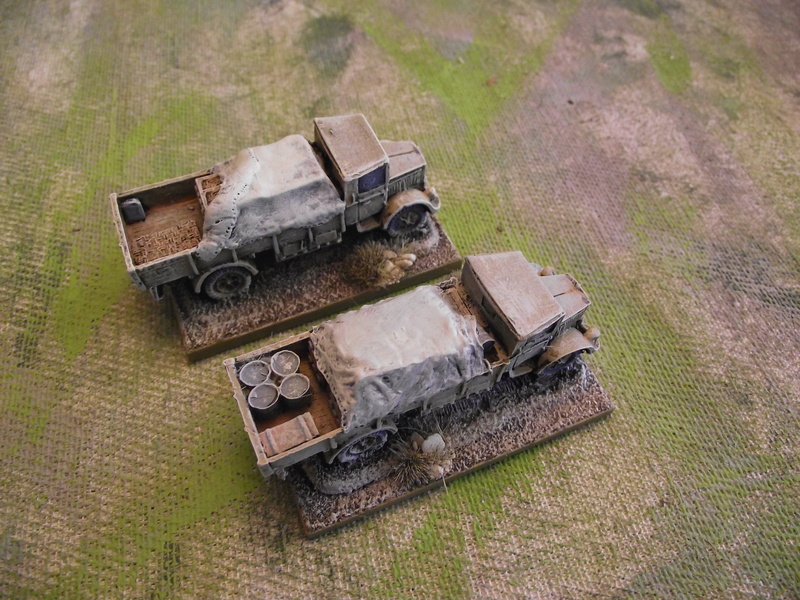 Two Lancia 6 tonne trucks. You can never have enough trucks in the desert!! These are Battleground Flame of War figures, resin based and were rather nice to paint up. I love the fact the Italian trucks are just huge compared to the German Opels and the British assortment of trucks. Compared to the Pater Pig trucks I have these are slightly smaller, and better detailed. 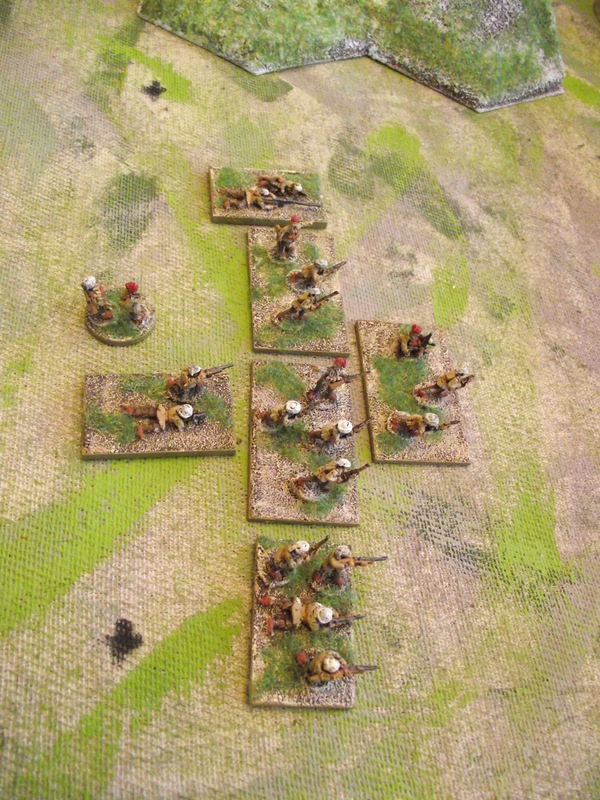 The first section of some Libyan Italian colonial troops – 3 rifles groups, a light MG group, an Anti tank team and a 45mm Light mortar team, plus command. I cheated with the MG group – it’s actually a lying down figure with an MG – but you can’t get colonial MG figures. Also the mortar team is created by cutting down the rifle of a lying rifle figure. Both conversions work on the assumption that at 3 foot distance you can’t tell! These are Battlefront Flames of War figures. I have painted them quickly – largely dry brushing and then adding details – I am not sure if I need to go in again and paint them tighter? Not for the Italians this time, a 231 8 wheeled recon vehicle for the DAK. 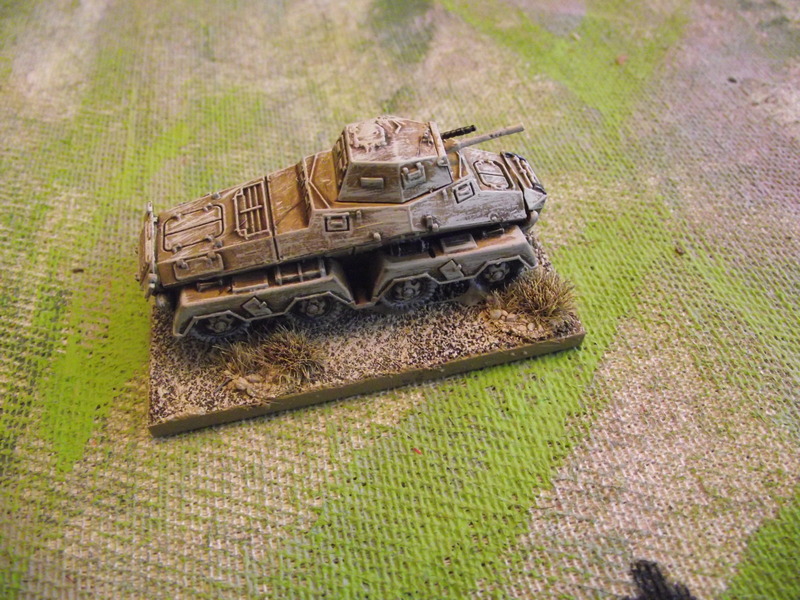 This is a Plastic Soldier Company vehicle, made up very quickly – and a quick paint job and Voila!!. Need to put some transfers on it. I intend to make a radio and a HQ vehicle as well. I couldn’t help but be reminded of the all-terrain vehicles you always saw in programmes like Thunderbirds – I wonder if they took the 231 as an inspiration.